A blend of hand-picked tea leaves with natural bergamot essence. This delicately scented, aristocratic blend is an international favorite. 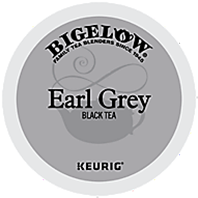 Brew Bigelow® tea K-Cup Packs in your Keurig brewer and enjoy the Café experience at home or work. Air-tight, single serve K-Cup Packs lock in freshness and deliver the rich, full flavor of Bigelow teas you know and love! Black tea is full of antioxidants and phytonutrients which are good for your health. Some studies have shown that black tea may even reduce the risk of stroke and heart disease.